It remains impressive, how many good resolutions there are for the year to come looking at our eating habits. Less sweets, no alcohol, reducing body fat, eating healthy… who has not heard of them? However, implementing them is often too much or rather too tedious. Who likes to constantly check nutrition tables of groceries or meticulously stick to a nutrition plan? The consequence: In the end none of it is rightly implemented. What remains is nothing but frustration. Do it completely different in 2019: keep it simple! Eat varied and healthy. If you follow some easy steps on a daily basis, your health will profit. Often it is the small things that help achieve the big goals. It is worth it! What is true for life, is true for food: eat as colorful as possible. Pimp your meals daily with fruits and vegetables, as colorful as a rainbow: This is because the variety of colours are so healthy, as they provide the body with different and important nutrients such as vitamins, minerals and also secondary plant compounds. “Red” e.g. = tomatoes, “green” e.g. = lamb’s lettuce and French beans, “blue” e.g. = blueberries, “orange” e.g. = carrots, “yellow” e.g. = corn, “white” e.g. = onions. Enjoy at least three portions of vegetables per day (e.g. one portion for lunch and one for dinner plus a bowl of side salad) as well as two portions of fruit. Apart from the energy we get from food, we also need sufficient fluid in order to feel good and stay healthy. This is true not only for hot summer days. If there is a lack of fluid in our organism, concentration and performance can decrease, both in our everyday life and during sports. Particularly when you do sports, you should make sure to drink sufficiently to avoid starting your training or competition with a fluid deficit. 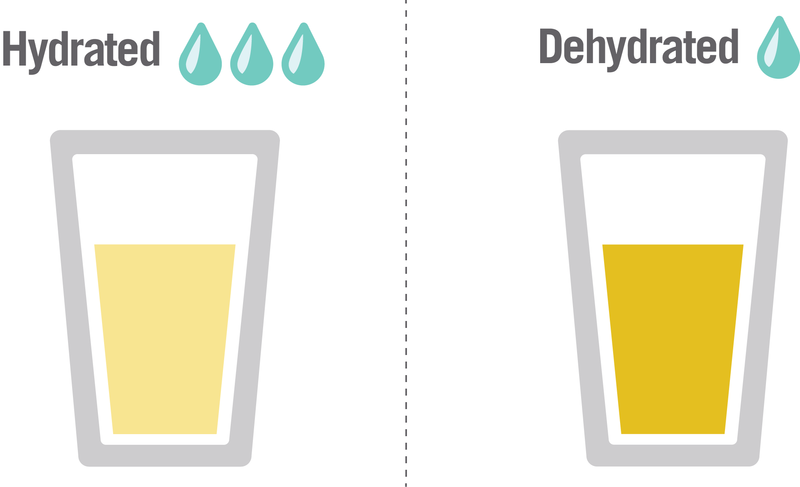 To highlight a fluid deficit, it is worthwhile to check your urine. The colour can be a good indicator of your fluid balance. If it is pale yellow, there usually is no need to be concerned. If it is dark and equals the color of beer or apple juice, it might on the other hand be an indication of a deficit. If this is the case, try to drink more frequently throughout the day or work out an individual hydration strategy. What is the best drink, after all? It’s all about water! Admittedly soft drinks are extremely tasty, yet these sugary drinks and even beer are real calorie bombs. Those who struggle to drink pure water and need a flavor kick, have other calorie-free options. Water with a dash of lemon juice, fresh ginger, a slice of cucumber or mint leaves is refreshing, just as are unsweetened fruit and herbal teas. Even coffee, in moderation of course, can be part of the daily fluid intake. Smoothies as well as freshly-squeezed juices can be drunk “on top” if you face high carbohydrate requirements as a result of strenuous physical work or intense physical activity. There should never be a lack of sufficient protein on your nutrition plan. Chicken, beef steak, salmon, eggs and curd cheese, all of these contain a lot of protein. Protein supports the feeling of satiety. The latter is not even the main reason, why you should eat protein at every main meal as well as after sports and as a snack in between. Protein is crucial for our immune system, a healthy organism and supports muscle growth and maintenance. Therefore, we should ideally eat this building block in regular intervals throughout the day. 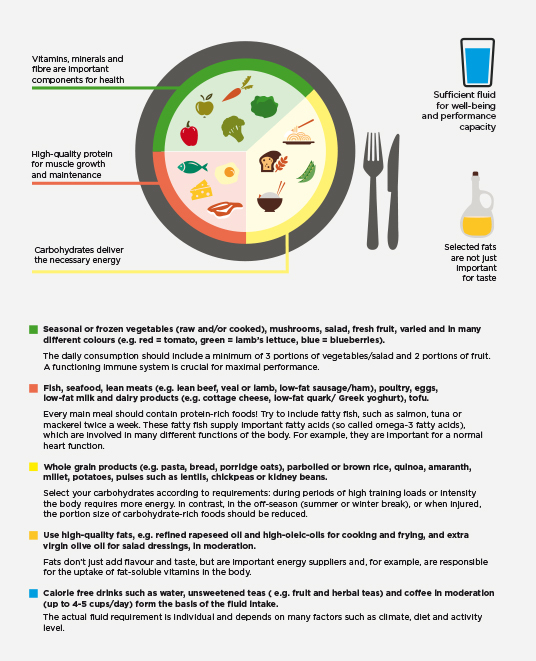 What does a nutrition plan like this looks like? Here is an example: Have cottage cheese for breakfast, grilled salmon filet for lunch and scrambled eggs for dinner, for instance, and a protein shake (such as DELUXE PROTEIN powder) after strength training. Carbohydrates are controversially discussed. Low carb or high carb? Crucial for health and physical performance is the type of carbs, how much and to what time they are eaten. Follow the mantra - eat as naturally as possible. Eat carbohydrate rich foods that are minimally processed and gently cooked – whenever possible. Favour steamed potatoes over fries and when it comes to pasta and bread, opt for the wholegrain variety over common white flour products. It’s worth it. If you go all-out during sports, your body needs a lot of carbohydrates as it burns a lot of energy. Vice versa this also means for example during recovery periods and times of less physical activity, the portions of pasta, bread, potatoes and rice can be reduced. Something that should not be found on your plate too often are so-called empty carbohydrate foods. They are poor in nutrients and dietary fiber and in the worst case contain added sugar. These foods include white bread and sugary cereals and cornflakes. Good to know: immediately before, during and after exercise or competitions easy digestible and readily available carbohydrates can absolutely make sense. Eat healthy and tasty. The PowerBar plate model supports you to put together your ideal main meal. So, what are you waiting for? You already made the good resolutions: start with us into a healthy and sporty year!